TREZOR was the first hardware wallet on the market. 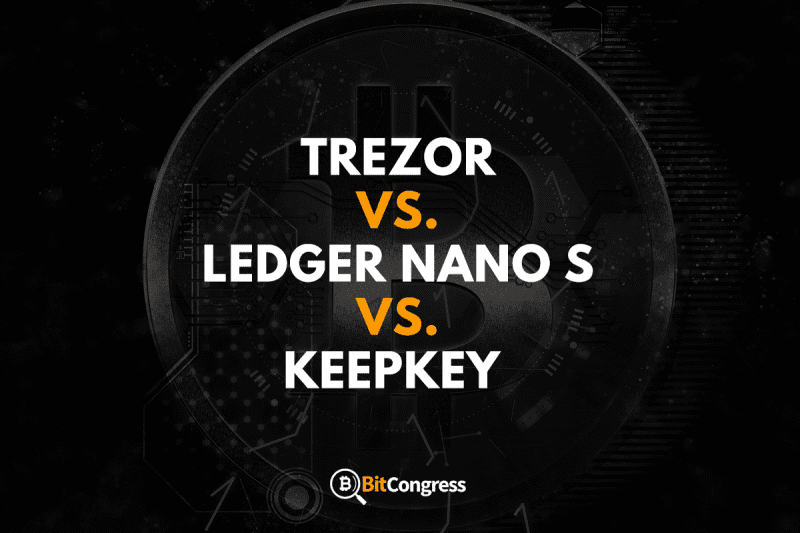 Today, however, it got two main competitors – the Ledger Nano S and KeepKey. With competition comes lower prices and competitiveness to bring out the best product possible, to win over the most customers possible. This is great for us as consumers, but it can indeed make the decision harder. In this article, we will compare the most popular hardware Bitcoin wallets and so that you easily can see what they offer, and which truly stands out as the superior (so far). First off we will talk about the pricing of each of these wallets since that’s one of the biggest factors when selecting which to buy. Ledger Nano S $94 Buy here! 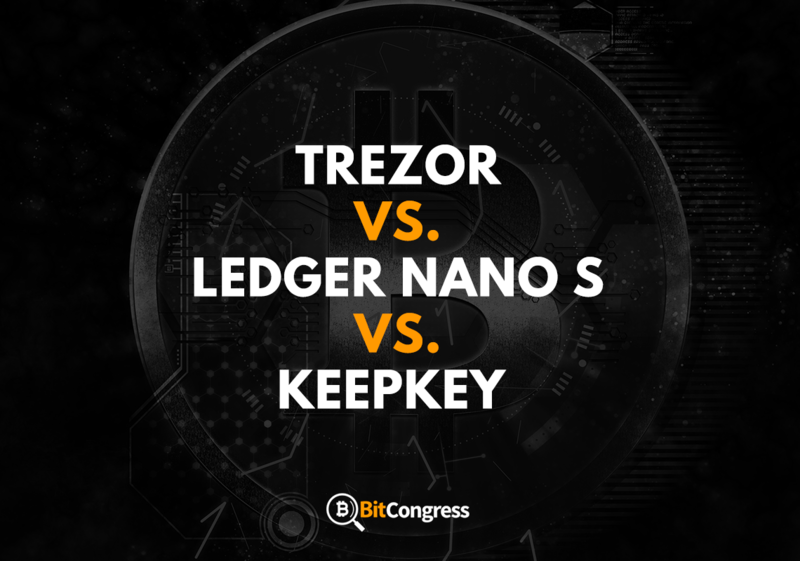 As you can see, the Ledger is more than 30% cheaper than KeepKey and TREZOR. This makes it a great choice for those with a tight budget or someone that doesn’t want to spend more than necessary on a hardware wallet. All of the compared hardware wallets in this comparison have screens. This is something we highly recommend that you look out for when choosing a wallet since it helps you easily set up, back up and enter the wallet. The security of each device is very similar. While Ledger Nano S uses two secure chips, and KeepKey and TREZOR are more like small computers, this doesn’t change anything security wise. As mentioned earlier, each of these devices has screens which help you easily store and backup your wallet in case of any error. Also, these three devices are so secure that they can even be used on computers that are infected by malware or hacked. That goes to show how secure they are. Setting each wallet up was a breeze. It only takes a few minutes to get the wallet up and running. You simply write down your recovery code on a piece of paper (so that you don’t forget it), and then you set a password for your wallet. Make sure to put this down on a paper as well in case of you being attacked by aliens and they destroy all your memory and you forget the password – or something like that. Better be safe than sorry. Right? The size and design are not really as important as the security is, but having a bulky wallet is no fun. The TREZOR is by far the smallest of these hardware wallets. The Ledger Nano S is foldable when it isn’t being used and is, while folded, just as small as the TREZOR. KeepKey, on the other hand, is much bigger. However, the screen on the KeepKey is bigger than on the Nano S and TREZOR. The physical buttons available on TREZOR and Ledger Nano S is 2, while on KeepKey it is 1. The TREZOR is made of plastic while Nano S and KeepKey is made of aluminum – while aluminum sounds fancier, one can actually argue that plastic is more drop resistant. In our honest opinion, size and design truly don’t matter. It all comes down to preference on this one since the most important part is the security, the ease of use and the price of each wallet. To be able to use the wallets you’ll need to connect them to software of some sort to be able to use the wallet. This allows you to store multiple cryptocurrencies in one wallet, such as running MyEtherWallet and storing Ethereum on any of the hardware wallets. Below you’ll see which wallets support which Bitcoin wallet software. Which of these wallets are truly the best? Ledger Nano S and the TREZOR are alike since they are matched in size, screen size and the number of physical buttons. The main difference is that the Ledger Nano S is $39 cheaper. The KeepKey is more bulky and large but comes at the same price point as the TREZOR. They are all three great Bitcoin hardware wallets that can store your Bitcoins (and other cryptocurrencies) securely in. The decision comes down to price – and that’s why the Ledger Nano S is the winner. Best Ethereum Faucets 2019 - Viable way to Earn Free Ether?